and she’s 15. Oh right. Great parents. He comes from a family of 9 and she almost as many. They live in “COUNCIL HOUSING” friends. Council housing. Has a ring to it huh? For Americans who may not know, but I suspect you do know, “council housing” is the same as our “low income” housing. As in no income except welfare income. And mommies and some daddies here get PAID SO MUCH FOR EACH KIDDIE! And I suspect again that soon as these kiddies are no longer kiddies but late teens, well ,, I remember an old movie called Cheaper By the Dozen. Hey that’s almost funny when you think about it. There are working parents who CAN NOT AFFORD more then one or two children at most. But ... you see this one coming right? They’re supporting thousands (I don’t really know the exact figure) of welfare families with multiple kids and more on the way. OH BTW .... I ALMOST FORGOT. THIS ISN’T EXACTLY THE END OF THIS STORY. Chantelle Stedman can claim no benefits until she reaches 16, her next birthday. But state benefits to support her and her baby will be paid to her mother Penny until then. At a minimum, the family can expect to receive around £30,000 a year - close to £600 a week. Penny, 38, will claim benefits to support herself and her four children including Chantelle. She will also claim on behalf of new-born Maisie. The family may claim benefits on the basis that Penny’s unemployed partner Steve is a live-in member of the household. * Child Benefit: Paid automatically for each child - £72.80 a week. * Council Tax Benefit: Likely to cover the full bill - £30 a week. * Child Tax Credit: Now the main payment to support children of out-of-work or low income mothers. Possible payment for the five Stedman children - £221 a week. * Income Support: If paid to Penny and Steve as a live-in couple - £94.95 a week. * Housing Benefit: Likely to cover the full rent of their council house, together with any service charges. This may be - £150 a week. * Total: £568.75 a week, or £29,575 a year. 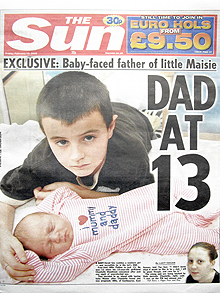 The schoolboy from Hailsham, East Sussex, was allowed to stay over at Chantelle’s house after originally meeting through their mothers. He was often seen emerging in the morning in his school uniform. Neighbours claimed that Chantelle’s mother Penny, 38, had been Alfie’s babysitter and cared for him at weekends to give his mother a break. But the two young people soon became “inseparable” and were, it was claimed, allowed to sleep in the same bed. “Before she got pregnant there were people going in and out every day but as soon as she got pregnant she was just in there all the time,” said one.